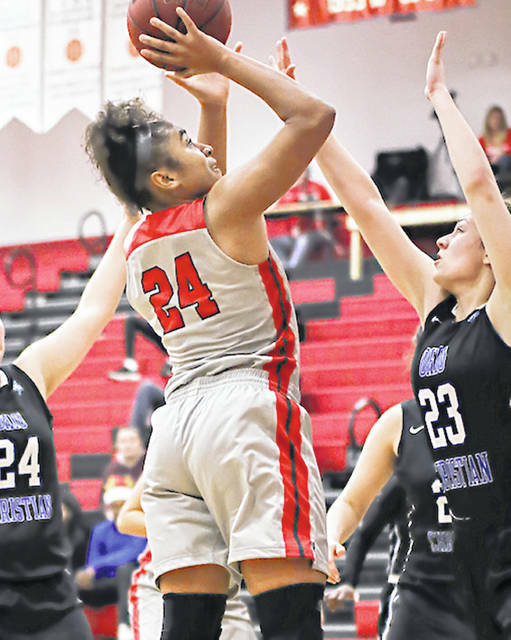 Rio Grande’s Jaida Carter surpassed the 1,000-point mark for her career and was one of six players to reach double figures in the RedStorm’s 102-75 rout of Ohio Christian on Saturday night at the Newt Oliver Arena. RIO GRANDE, Ohio — After a tough loss at River States Conference rival Indiana University East on Wednesday night, the University of Rio Grande couldn’t have scripted a better rebound effort. One player surpassed the 1,000-point mark for her career, another recorded the second triple-double in program history and two others recorded single-game career-highs as the RedStorm rolled Ohio Christian University, 102-75, Saturday night, in their RSC home opener at the Newt Oliver Arena. Rio Grande, ranked 18th in the most recent NAIA Division II coaches’ poll, improved to 8-2 overall and 1-1 in league play with the victory. Ohio Christian slipped to 1-8 overall and 0-2 in the RSC with the loss. Rio raced to an 11-point lead at the close of the first quarter and continued to pull away, taking a 20-point halftime advantage and leading by as many as 31 points, 69-38, after a three-pointer by junior Megan Duduit (Minford, OH) with 6:37 remaining in the third quarter. The RedStorm finished with six players in double figures, with a career-best 21-point performance from sophomore Jimi Howell (Barberton, OH) leading the way. Senior Jaida Carter (New Philadelphia, OH) had 19 points and became the 30th player in program history to hit the 1,000-point mark for her career on a jumper with 11.2 seconds left in the first half. Freshman Avery Harper (Seaman, OH) narrowly missed a double-double with a career-best 18 points and nine rebounds in the win, while junior Sydney Holden (Wheelersburg, OH) finished with a triple-double outing of 12 points, 12 rebounds and 10 assists – the program’s first since Brianna Thomas had 29 points, 11 assists and 10 rebounds in an overtime win over Shawnee State on Jan. 11, 2014. Sophomore Chyna Chambers (Columbus, OH) and senior Chelsy Slone (Gallipolis, OH) added 11 points and four steals each in the winning effort. Rio Grande shot 51.4 percent from the field (38-for-74), went 21-for-26 at the free throw line and enjoyed a whopping 53-29 edge in rebounding. Ohio Christian’s loss spoiled an outstanding effort from Staci Dinsmore, who finished with a game-high 22 points in addition to a team-high nine rebounds, four assists and four steals. Three others reached double figures for the Trailblazers – Helaina Limas (14 pts. ), Maddie O’Connell (13 pts. ), Kiara Rohrer (10 pts.). Rio Grande will return to action next Saturday with a trip to Wilberforce University. Tipoff is set for 1 p.m.